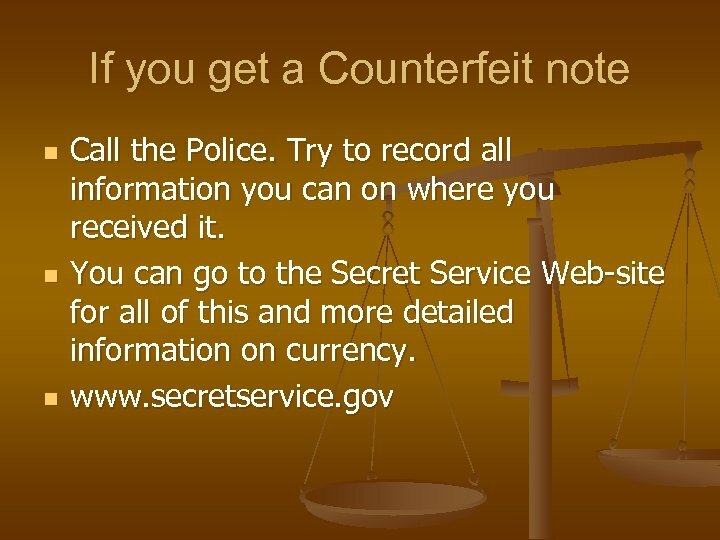 Facts from Secret Service n n Forgery has been around since writing began. 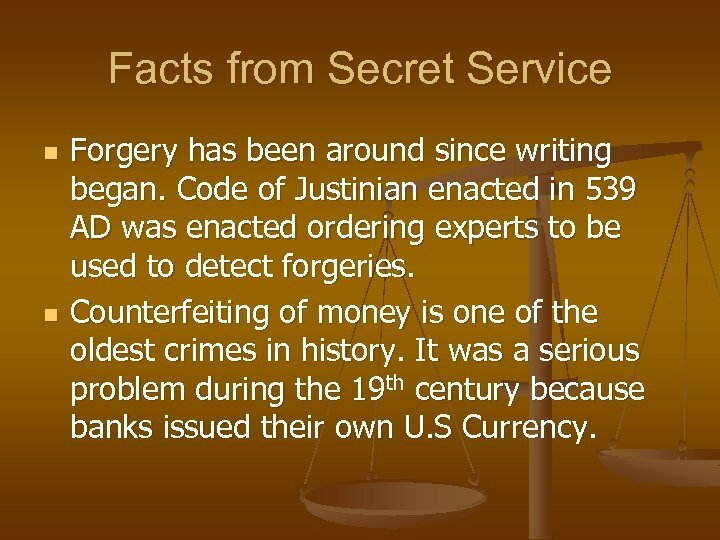 Code of Justinian enacted in 539 AD was enacted ordering experts to be used to detect forgeries. 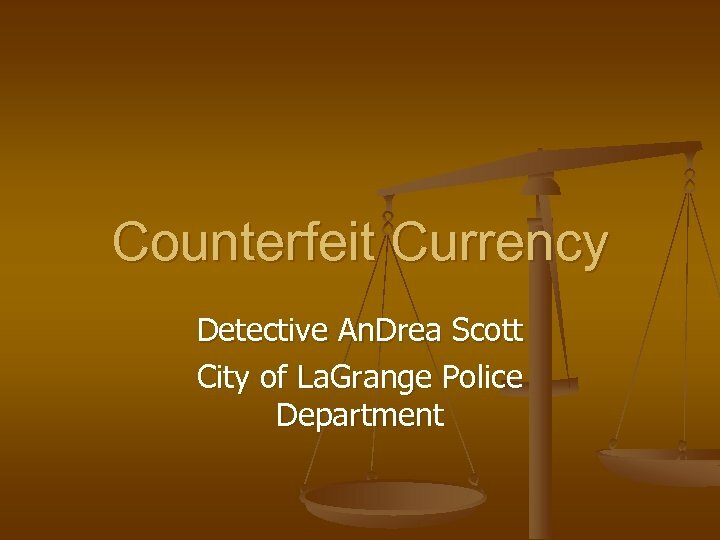 Counterfeiting of money is one of the oldest crimes in history. 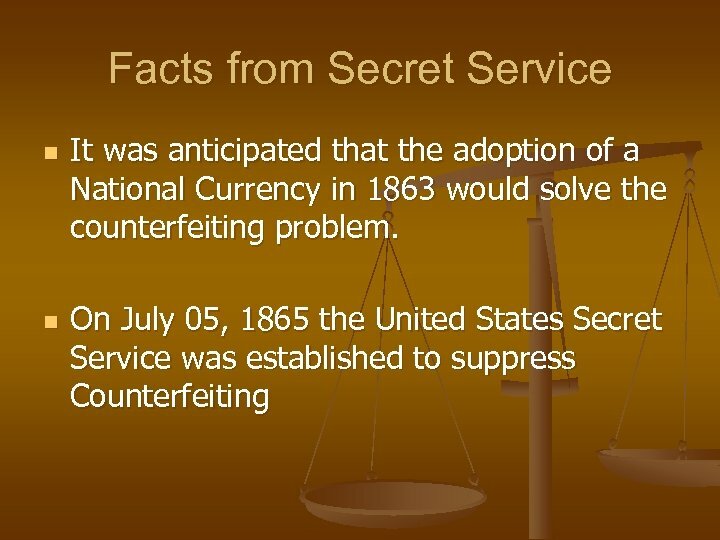 It was a serious problem during the 19 th century because banks issued their own U. S Currency. 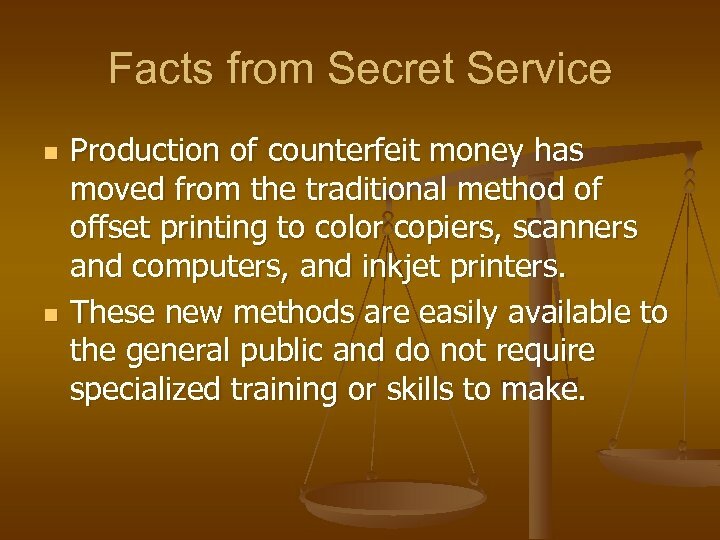 Facts from Secret Service n n Production of counterfeit money has moved from the traditional method of offset printing to color copiers, scanners and computers, and inkjet printers. These new methods are easily available to the general public and do not require specialized training or skills to make. 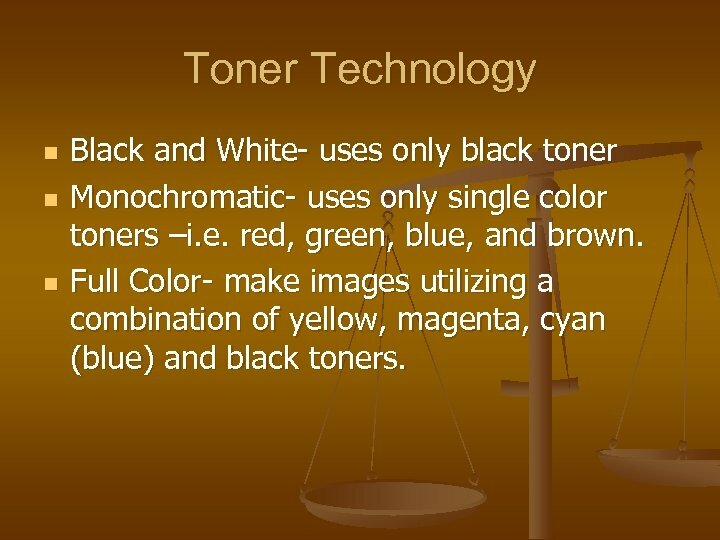 Toner Technology n n n Black and White- uses only black toner Monochromatic- uses only single color toners –i. e. red, green, blue, and brown. 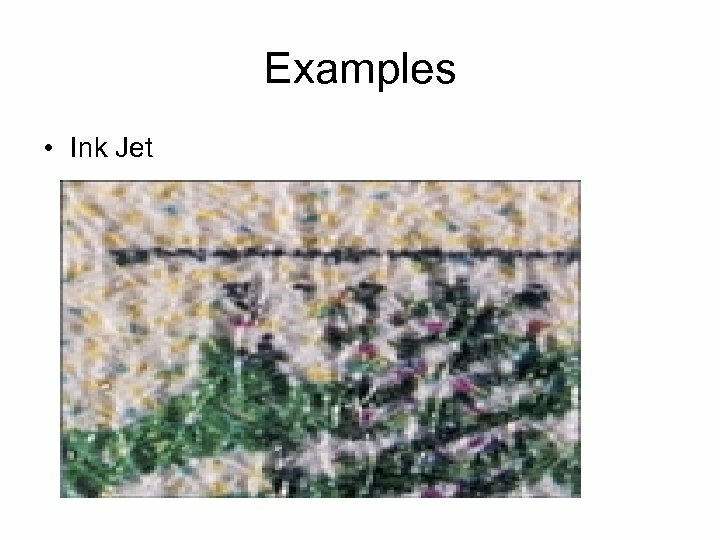 Full Color- make images utilizing a combination of yellow, magenta, cyan (blue) and black toners. 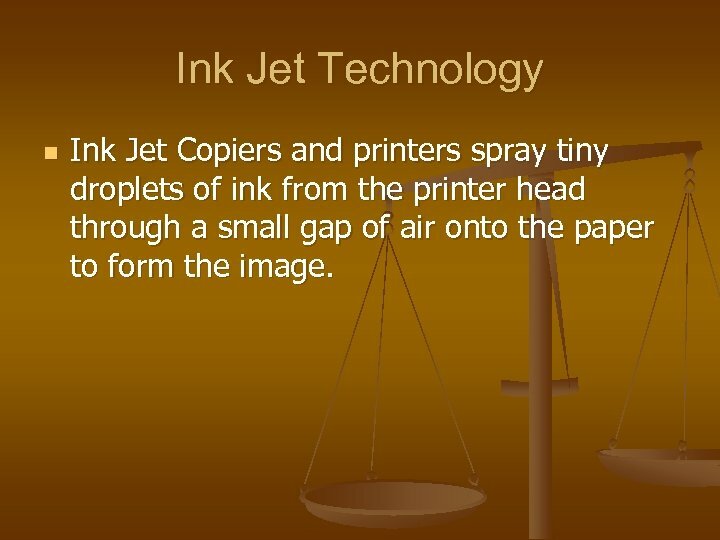 Ink Jet Technology n Ink Jet Copiers and printers spray tiny droplets of ink from the printer head through a small gap of air onto the paper to form the image. Continued n n n Clear, distinct and sharp. 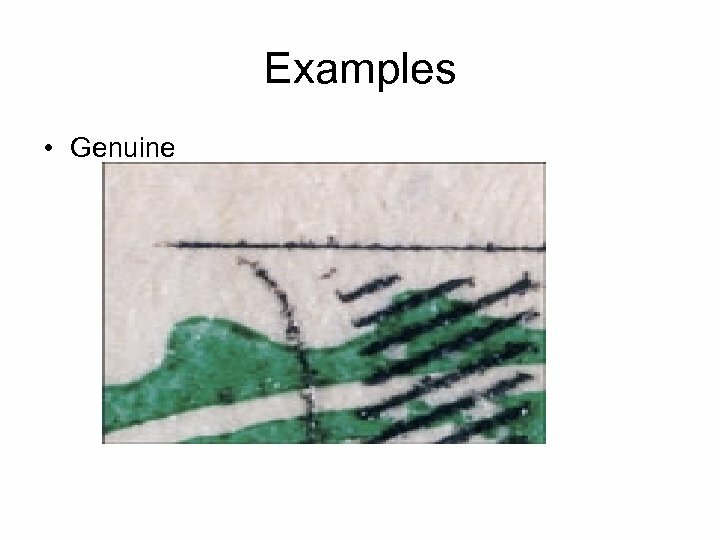 Counterfeits are uneven, blunt, or broken. 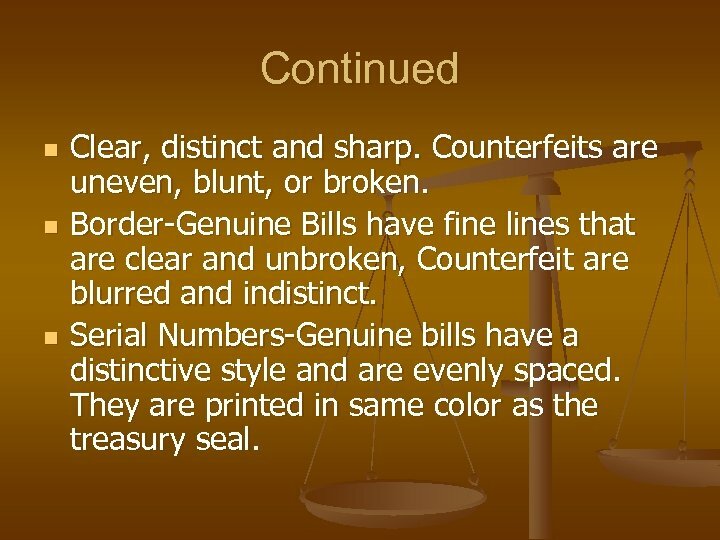 Border-Genuine Bills have fine lines that are clear and unbroken, Counterfeit are blurred and indistinct. 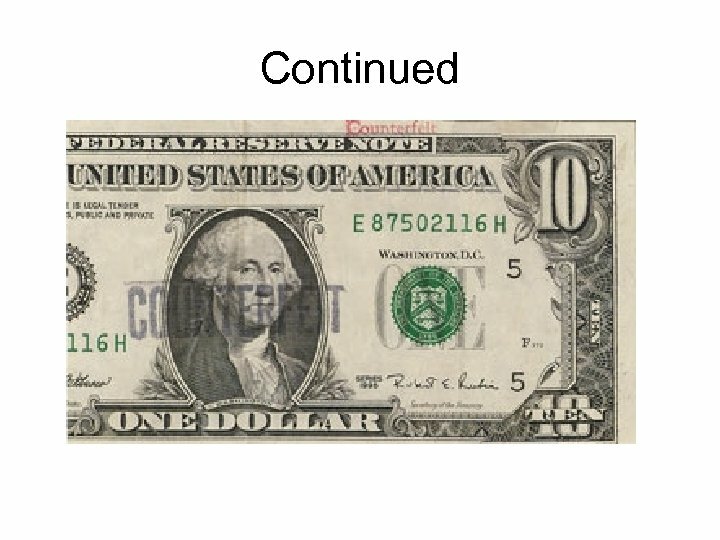 Serial Numbers-Genuine bills have a distinctive style and are evenly spaced. They are printed in same color as the treasury seal. Raised Notes n Genuine paper currency is sometimes altered to increase its face value. 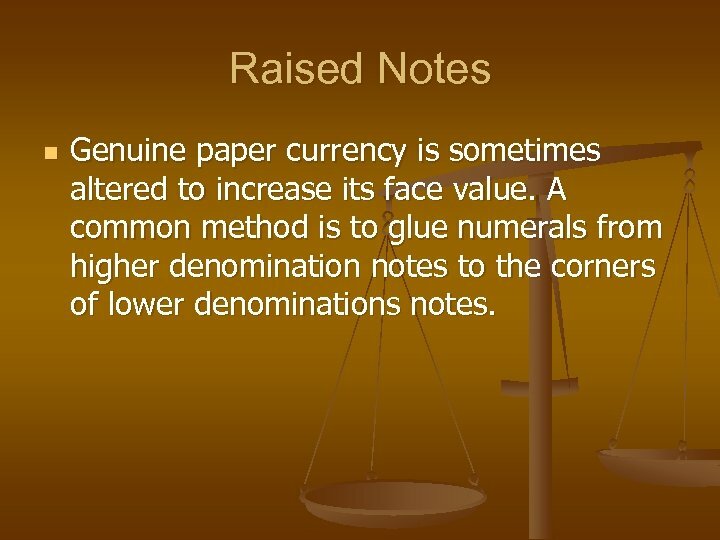 A common method is to glue numerals from higher denomination notes to the corners of lower denominations notes. 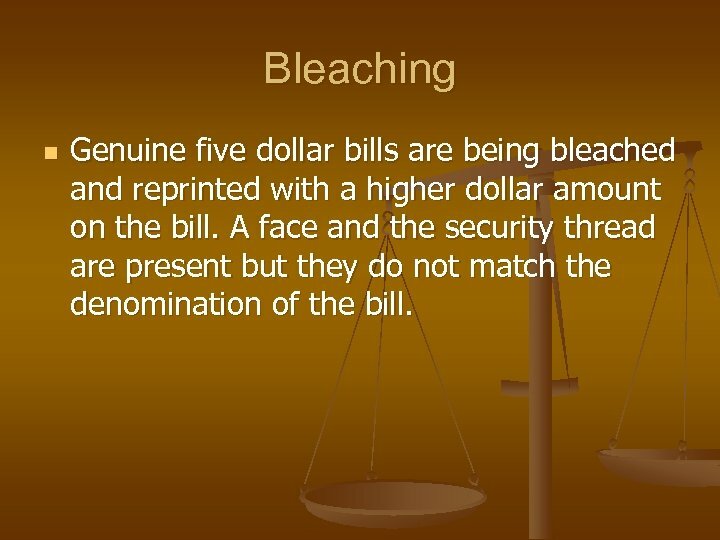 Bleaching n Genuine five dollar bills are being bleached and reprinted with a higher dollar amount on the bill. A face and the security thread are present but they do not match the denomination of the bill. 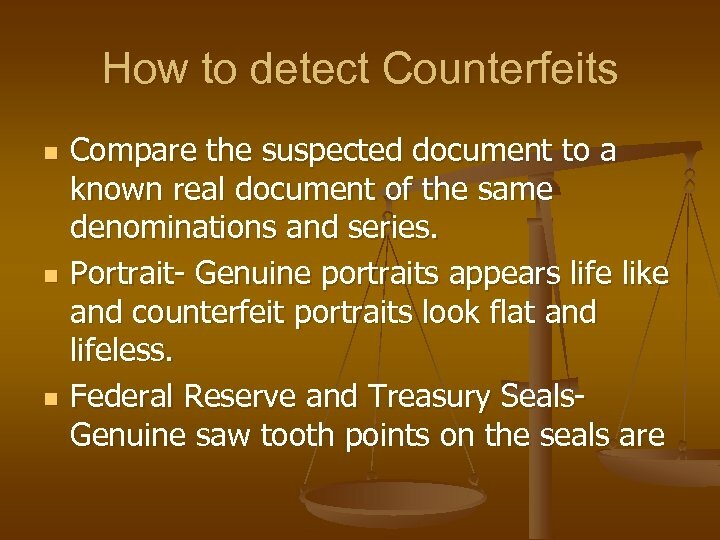 Ways to detect Counterfeits n n n 1. Physically examine the front and back of the bill. 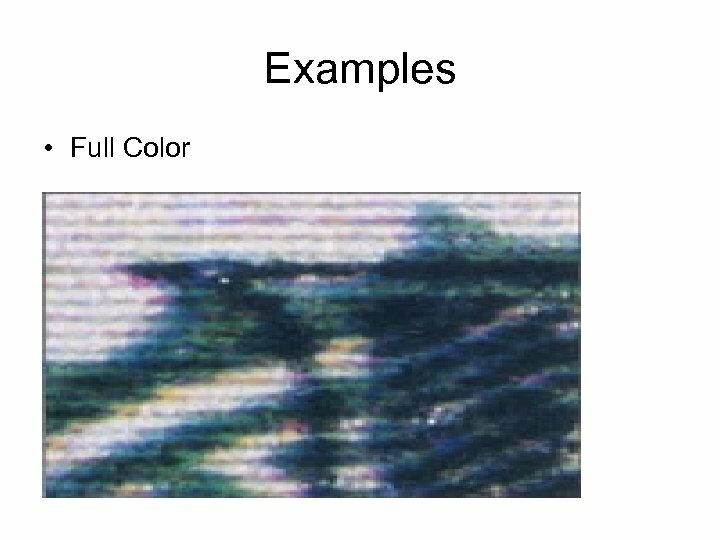 Look for obvious features. i. e feel of the paper, size of the bill, security features present for that particular bill. 2. U. V. light-Under U. V. light the security thread glows a different color per denomination. 3. 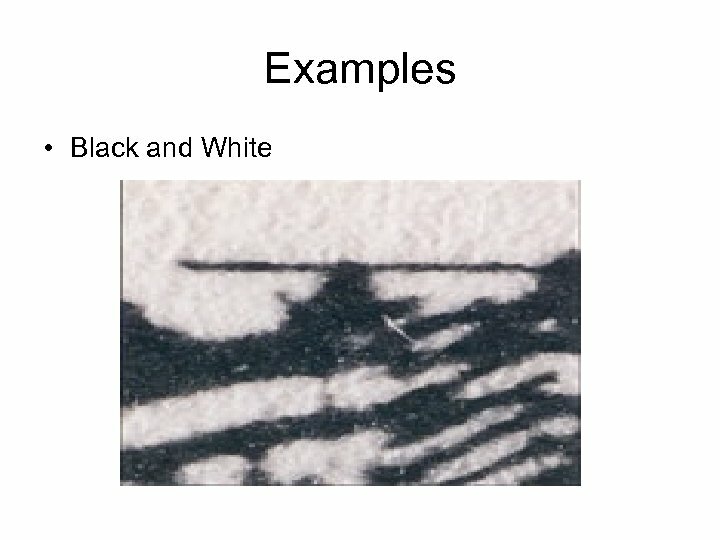 Magnification- You can use a magnifying glass to observe red and blue fibers. 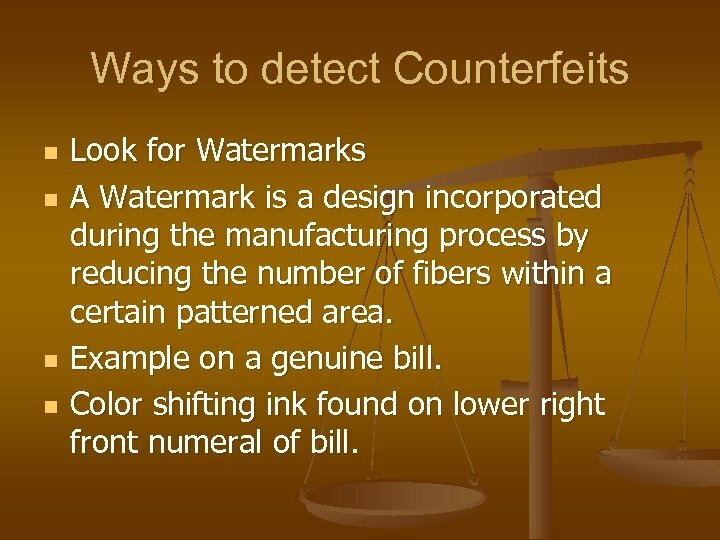 Ways to detect Counterfeits n n Look for Watermarks A Watermark is a design incorporated during the manufacturing process by reducing the number of fibers within a certain patterned area. Example on a genuine bill. 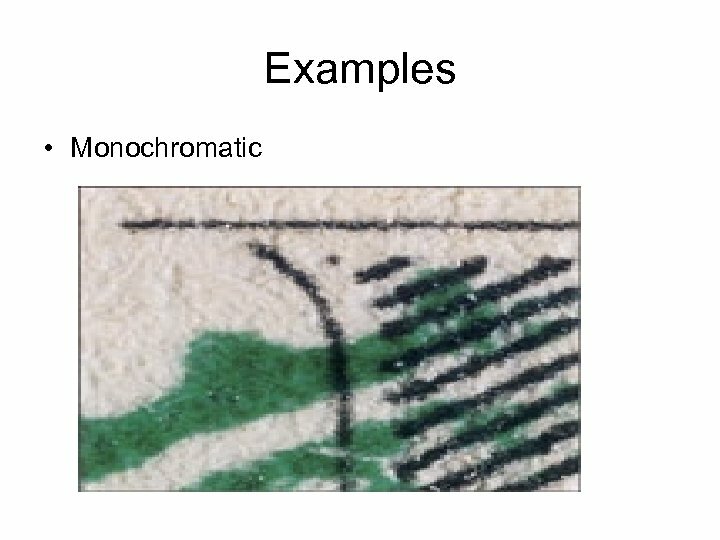 Color shifting ink found on lower right front numeral of bill. 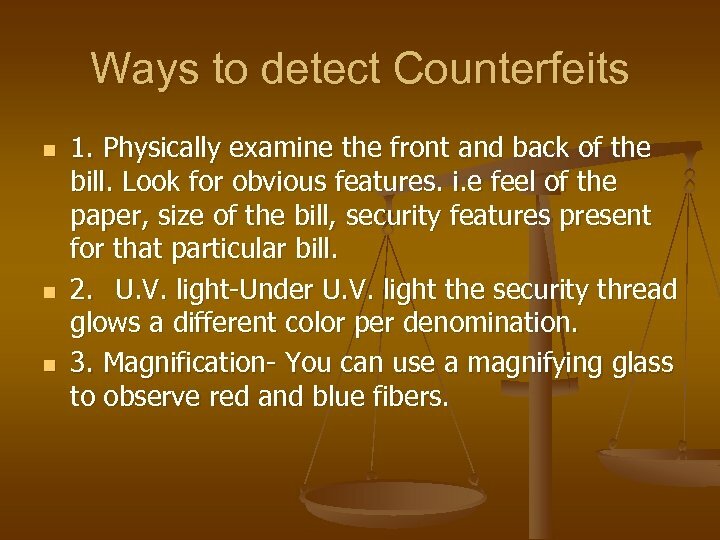 How to detect Counterfeits n If all else fails……. . Spit test! Or more common a water test. 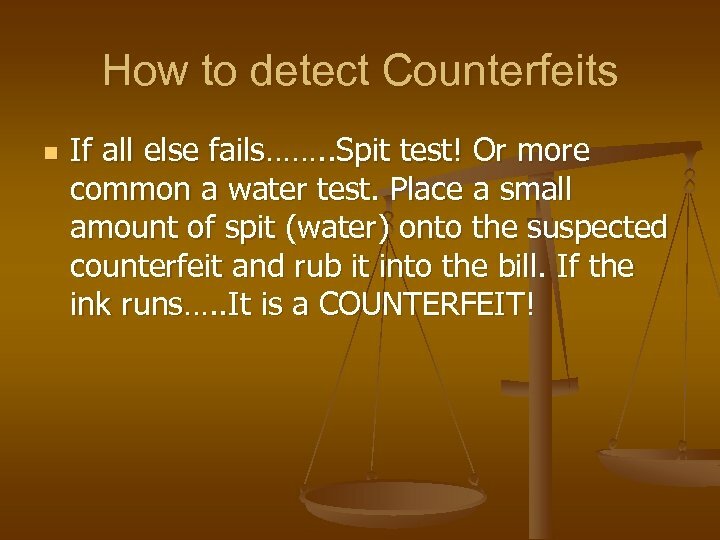 Place a small amount of spit (water) onto the suspected counterfeit and rub it into the bill. If the ink runs…. . 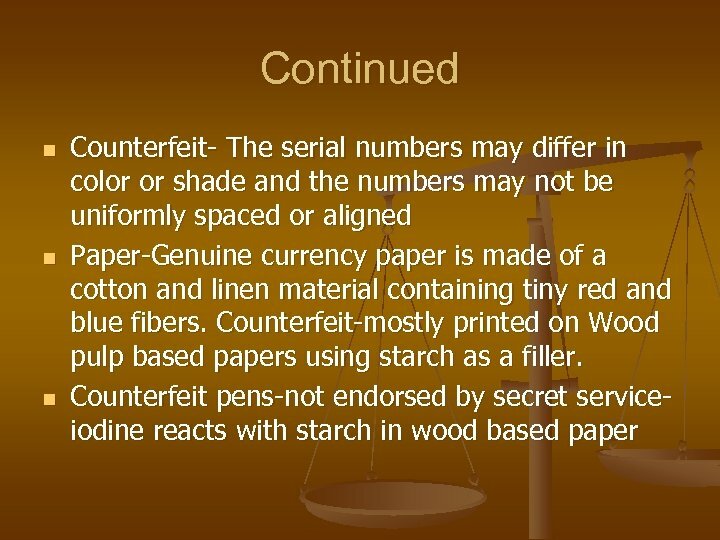 It is a COUNTERFEIT! ? ? 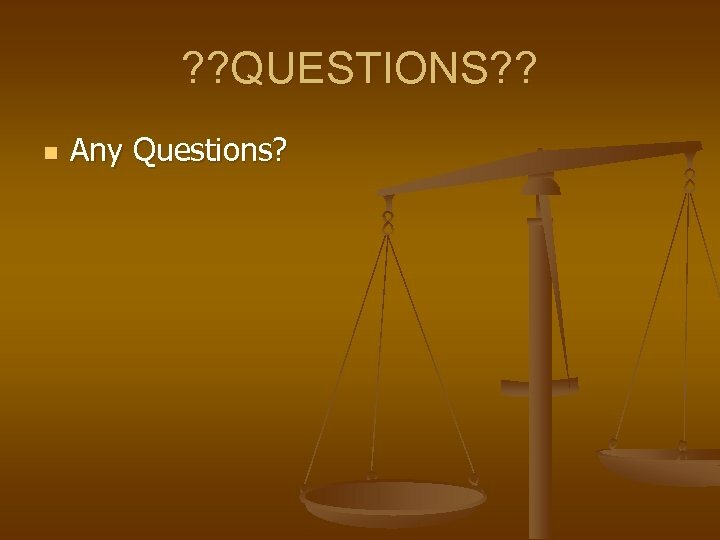 QUESTIONS? ? n Any Questions?